Use your Netatmo Thermostat to change your home's temperature, from your bed or from the other side of the world. Schedule your heating for your return from a holiday. The Thermostat uses your answers to 5 questions to create a schedule that’s based on your habits and lifestyle, so you only use the heating when you need it. The Netatmo Thermostat’s Auto-Adapt function uses your home’s insulation and the outdoor temperature to programme when your heat should switch on. So you can have the temperature you want at just the right time. Thanks to its Auto-Care function, the Netatmo Thermostat can tell you when its batteries are low, or notify you of a problem with your heating system’s operation. Just say: "Siri, set my bathroom temperature to 20°C"
Just say: "Alexa, decrease my thermostat temperature by 3°C"
Just say: "Ok Google, set the thermostat to 20 degrees"
Just type: "Set my thermostat to 20°C"
Every month, you receive your customised Energy Savings Report. The report will help you track your consumption and adjust your heating schedule for optimal savings. Display your past energy consumption. 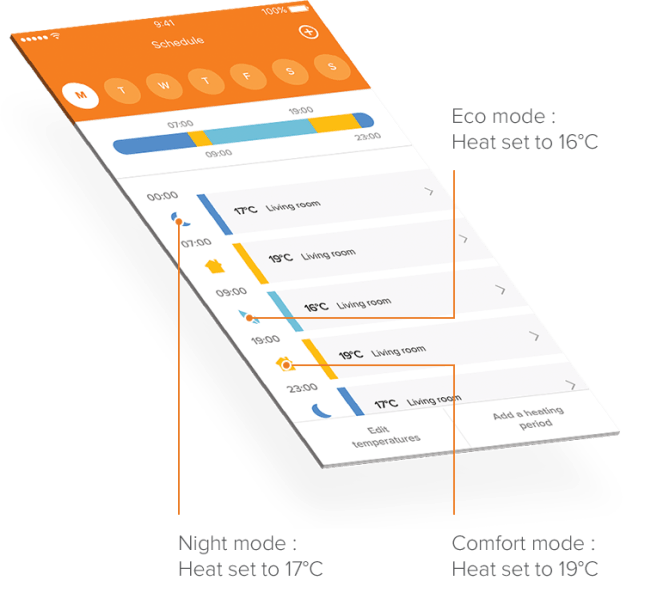 Your indoor temperature and boiler activity are recorded continuously in the App. If you want a super easy way to control your heating and lower your energy bills, then this is for you. I particularly love being able to turn on my heating from 7,000 miles away, so my home would be warm where I got home f om the airport. Modern living at its best! Customise your Thermostat with one of the four colour adhesive strips provided. Energy savings, longer battery life. Opt for a timeless, minimalist design. Press on the Thermostat to change the temperature setting. Display the temperature setting and the real-time temperature in the room. Complete your Smart Thermostat with the Additional Smart Radiator Valves and control all your radiators. Thanks to the room-by-room planning, each room will be heated based on its use.